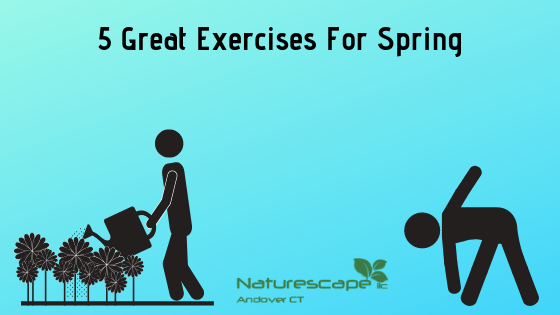 Deadlifts for weeding or picking up dropped items: Practice dumbbell or barbell deadlifts in the off-season and your lower back and legs will be stronger when the spring season gets going. Hold a barbell in front of your hips with hands slightly wider than shoulder-width apart and feet shoulder-width apart, knees slightly bent. Maintaining bend in the knees and keeping chest out, back straight, and abs engaged, push hips back and lower the bar to just below knees. Pause, then return to standing. Raking pushups: Stand to face a countertop, with your hands shoulder-width apart on the counter. Bend your arms into a pushup position. Straighten your arms, and repeat 15 times Use short, quick motions, to mimic keeping the rake close to your body. You should switch sides every 2 to 3 minutes. Squats: Keep your back straight and your weight in your heels. Bend your knees and squat as low as you can and then repeat 10 to 12 times. Do 2 to 3 sets, increasing repetitions as you get stronger. Farmer Carry: This exercise mimics carrying buckets of water, compost or soil through the garden. If you’ve ever carried a bag of groceries in each hand, you’ve already performed a Farmer Carry. If you don’t have heavy enough weights to make this simple motion a challenge, grab a few large filled water bottles. Topped up with water, they weigh about 25 pounds each. You can add the weight as you get stronger. Lift each bag as high as you can and hold for 15 seconds. Continue lifting as you walk towards the door. Hollow Body Hold: Lie faceup with arms by sides and legs extended straight. Engage abs. Lift shoulder blades and straightened legs off the floor, keeping lower back pressed into mat throughout the entire exercise (the closer your legs are to the floor, the more challenging this is). Also: When you have time and are able to park far away from the front door to get your walking exercise in. This is a great way to avoid dings on the car too! When you have an option of elevator or stairs, take the stairs. Feeling energetic? Hop on the way down to mimic skiing bumps runs. Do all these as much as you can. After all, if you want to use it; USE IT!